Over the years, I’ve grown a true appreciation of the fact that everyone is uniquely different. Yes, we have common goals, similar interests and complimenting personalities with our fellow inhabitants of this planet. It’s in this paradigm where we get the opportunity to enrich each other and cultivate relationships. The notion that “everyone is uniquely different” first hit me hard when I was 16 years old watching Ben Hur when Balthasar, one of the three “wise men” of Christian tradition, turns to Ben Hur and says “There are many paths to God—I hope yours will not be too difficult.” 26 years later, this quote is still engrained into my soul. I think about it often; yes, from a religious standpoint, but more from a journey / destination perspective. It again hit me in my 20’s when I was on a bus up to San Louis Obispo to visit friends. As I looked around the bus, I wondered about the stories of all the passengers. Who were they? Where are they coming from and where are they going? For some reason, the uniqueness of all these people silently screamed out to me. We were all strangers packed in a tin can driving 70 mph down a highway to whatever destination USA. Around that time, I developed a love for airports. Before 911, we were allowed to go into airports and wait at the terminals where the planes had docked. This is where my thinking progressed that there are not only many kinds of people in the world, but many kinds of love as well. At the airport, people would embrace each other in deep hugs and long kisses while saying their heartfelt “goodbyes”. When passengers arrived; children, parents, siblings and lovers would scream with delight at the sight of their loved one. It was here that again, people were also sitting down, waiting for their plane to arrive and it took me back to my days on the bus. Maybe I was a weirdo, but if there’s anything that I loved as a young adult, it was watching my fellow men and women from all over the world come together in one place, while heading to another. There just wasn’t a location on Earth that demonstrated our relationships and the connections we made with one another more than the airport. As an adult, I see that my bus and airport experiences are all around me everyday. Additionally, I am now a greater part of these experiences as I am interacting more and more with the environment and its inhabitants around me. Again, my thinking progresses from one-of-a-kind human beings who love, to people who also act and react uniquely to every situation. Everyone has their own way of thinking and how they deal with what’s presented before them. That said, there is also a story to every reaction in that how I respond to something today, may not be how I respond tomorrow or in an hour from now. As this relates to others, most of us run into situations daily where we say to ourselves, “I would not have acted like that person just did”. All too often, people get caught up with the NOW and say and do things that are hurtful to others, whether it’s intentional or not. Again, we are ALL so different. It’s one of the things that makes WE, as a human race, so wonderful and unique in our limited view and understanding of the universe. It’s where one person finds a scene in a movie to be emotional and tear-jerking, and the other sees it as laughable. It’s where one person connects with the color blue, and the other person connects with red. We are also physically different from each other. The taste buds on my tongue and the sensors on my fingertips will literally have a different result than someone else’s by the time that data gets processed in our brains. I’m not even ashamed to give social media dating apps as an example here. For those of us “singles” out there, we swipe right and left constantly. One person will live for skiing and outdoors adventure, where the other just wants to stay local. One person will absolutely love dogs and the other will say that they’re a deal breaker. With friends, I see people with low self-esteem with great empathy towards others and I see people with a high self-esteem with not as much empathy. Personally, I tend to fall more into the former sometimes. In gatherings, we have committee meetings and focus groups where we go back and forth on whatever issues. Today, we have Presidential candidates who are vastly different while practically opposing each other at every turn. We the people, are very different as individuals at how we internalize and externalize ourselves. This leads me to the title of this article, “What I Continue to Learn at the Starbucks Drive-Thru”. A month ago, my daughter and I were in line at the local Starbucks waiting to order. As the cars were lined up in the parking lot, the cars in front of me moved up and had pulled into the ordering area. Like what most people do, I left a small gap between my car and the car in front of me so that other cars (not in the drive-thru) could pass by in the small parking lot. At that time, a young lady in a car bypassed my vehicle and pulled in front of me. I was shocked that someone would cut in front of me like that. I tried to get her attention with my “Hey look at me being mad face” but she didn’t bite. She ordered, got her drink and took off. I don’t think that I was “furious” as much as I was in disbelief that someone could do this. How rude. When I drove up to pay for my drinks, the barista informed me that the young lady claimed that she didn’t see me, felt bad and paid for me. That was nice of her to pay for my drinks but I think the REAL take home from this is that all she really had to do was acknowledge me and give me the “whups, sorry I didn’t see you face”. That would have been enough. But instead, she opted to stay completely non-confrontational and “buy” her way out it. I was appreciative for the drink, but what I think could have been better was human interaction and a little faith in mankind. My other example is something that happened this morning. This time, parking then walking up to the same Starbucks, I saw a couple friends of mine in a car while waiting in line at the drive-thru. Her car was located in the EXACT same place I was at in my former story. Naturally, they rolled down their window and we talked a bit. The car in front of them pulled up and my friends (like I did) left a small gap between cars. The guy right behind my friends I was talking too rolled down his window and start cursing profanities at me and saying I was “holding up the line” by talking to my friend. Note: the car in front of us wasn’t even at the ordering window yet. The man was clearly impatient for no apparent reason and being a real jerk. I wrapped up my conversation and said to the impatient man in the car “There, now you can pull up 15 more feet. Have a nice day, sir.” He scowled, cursed at me and pulled up to his proper place in line. Perhaps I could have found different words. Perhaps I could have bought him his coffee. Perhaps he could have let a couple friends talk when it clearly didn’t affect his schedule for the day. I didn’t know his story though. I didn’t know what might have happened to him earlier in the day. I don’t currently know if he lacks self-esteem, empathy or both. Perhaps he’s the greatest guy ever, caught in a bad moment. One thing’s for sure, I forgive him. Perhaps that’s all that was needed. There needs to be a common ground that we can ALL stand upon which unites us as a species, yet appreciates us for our differences. From my experiences as an adult volunteer at YMCA Camp, I learned that the thing that binds us is an incredibly simple thought and action. Growing up, we hear the words “be nice”. Be nice to others and share. Be nice and use your words. Be nice and be respectful. Be nice and be truthful, caring and responsible. Be nice to yourself and eat healthy. 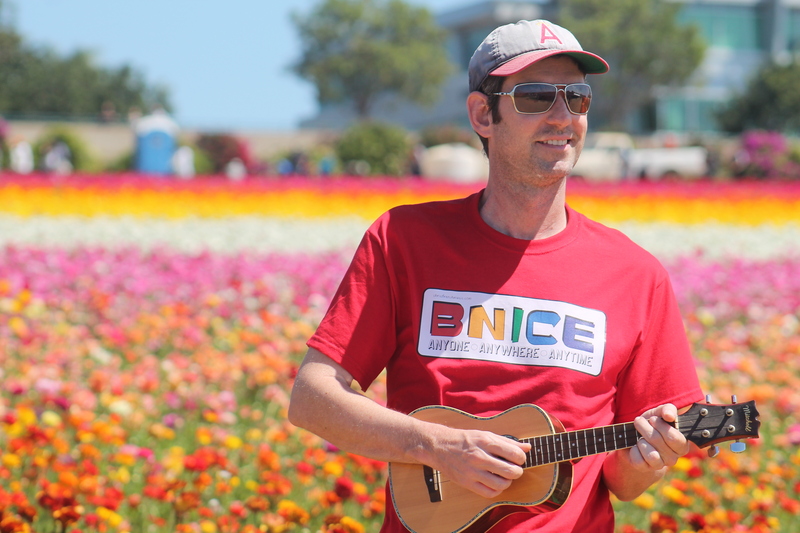 As a children’s musician, I recorded a song called ”BNICE” and realized that more needed to be done. This led me to creation of The BNICE Initiative: A Moral Awareness program that focuses on the importance of the relationship between being nice to oneself (improving self-esteem) and being nice to others (improving empathy). That BOTH aspects work hand in hand with each other to create a more morally aware individual. The idea that “being nice” to ourselves and to others is an ever encompassing notion that will increase our moral awareness and not only make us better as a species, but the physical world we live in. We never know for sure WHEN being nice to ourselves or others will pan out, but we have to stay morally aware and do whatever we can on a daily bases. In a favorite movie of mine (not so much most other people) “Lady in the Water”, a character learns that he will someday write a book that will inspire change in the world, but will not be around to see its benefits. In the future, a boy will pick up this book and begin a movement of great change. He will speak of its words and the book will be the seeds of many of his great thoughts. They will be the seeds of change. We are all different. We are all wonderful. We are all unique. We are all in the same bus heading somewhere. We are ALL in the same terminal awaiting for our next adventure. It’s what we do with that time that really matters. There are many paths to BNICE. I hope yours will not be too difficult.